Vickers / Microhardness test procedure as per ASTM E-384, EN ISO 6507, and ASTM E-92 standard specifies making indentation with a range of loads using a diamond indenter which is then measured and converted to a hardness value. For this purpose as long as test samples are carefully and properly prepared, the Vickers / Microhardness method is considered to be very useful for testing on a wide type of materials, including metals, composites, ceramics, or applications such as testing foils, measuring surface of a part, testing individual microstructures, or measuring the depth of case hardening by sectioning a part and making a series of indentations. Two types of indenters are generally used for the Vickers test family, a square base pyramid shaped diamond for testing in a Vickers hardness tester and a narrow rhombus shaped indenter for a Knoop hardness tester. The Vickers hardness test method requires a pyramidal diamond with square base having an angle of 136° between the opposite faces. Upon completion of indentation, the two diagonals will be measured and the average value will be considered. The loads for Micro Vickers or Knoop hardness testing methods are typically very low, ranging from a few grams to 2 kgs. 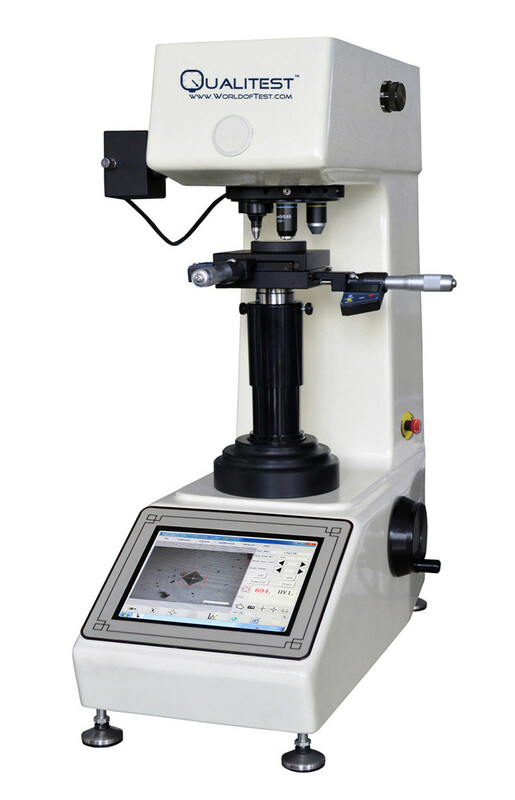 The load range for Macro Vickers hardness test procedure can range up to 50kgs. Normally the prepared specimens, using metallography mounting presses are mounted in a plastic medium to facilitate the preparation and testing. In order to enhance the resolution of measurement, the indentations should be as large as possible. A new line of Case depth hardness testers are also available from Qualitest, that can non-destructively, within a few minutes and using minimal surface preparations, measure the case depth hardness of materials.